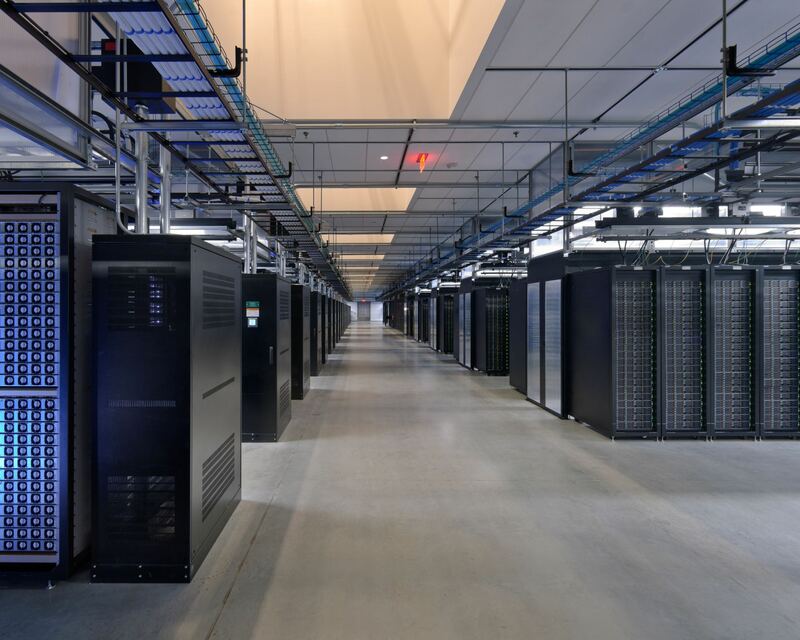 If you’re considering closing your Facebook account and leaving the service, you should store on your computer copies of the photos, videos, status updates, wall posts and other content you’ve published on Facebook thus far. 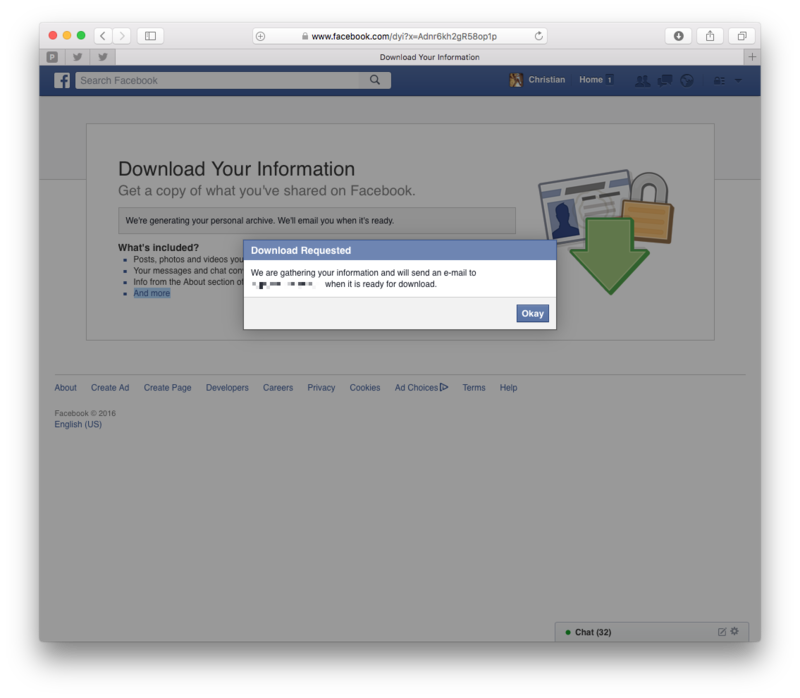 Thankfully, this can be easily done by downloading your entire Facebook data as a ZIP file. This gives you a permanent copy of a lot of the same information available to you in your Facebook account. This includes stuff like your Timeline info, posts you have shared, messages, photos and more, as well as data you did not create yourself such as the ads you have clicked on, logged IP addresses and what not. This step-by-step tutorial will guide you through the process of downloading an archive of your Facebook information to a computer, and exploring its contents. 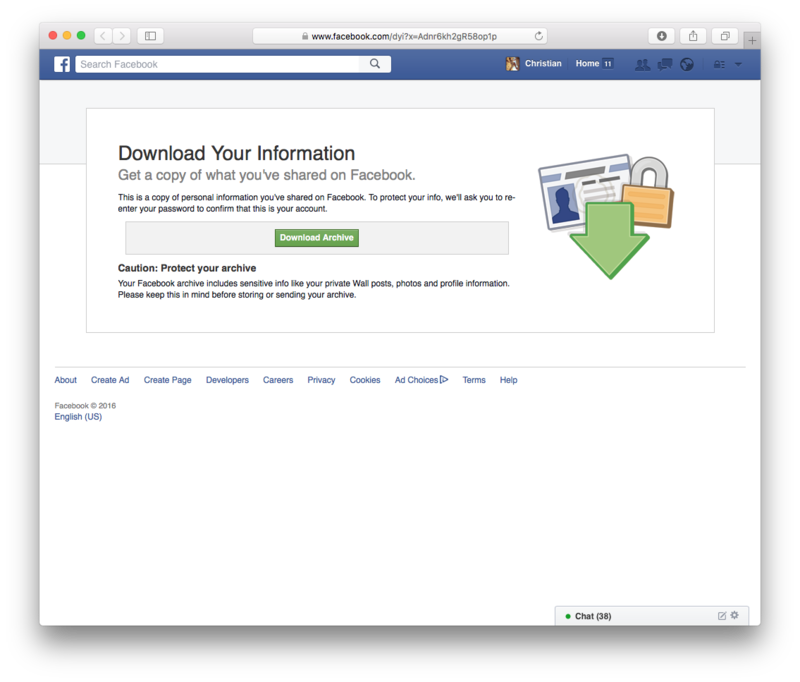 There’s no way to individually select which data you would like to download as part of your Facebook archive, so you’ll have to download the ZIP file in its entirety and explore its contents later. 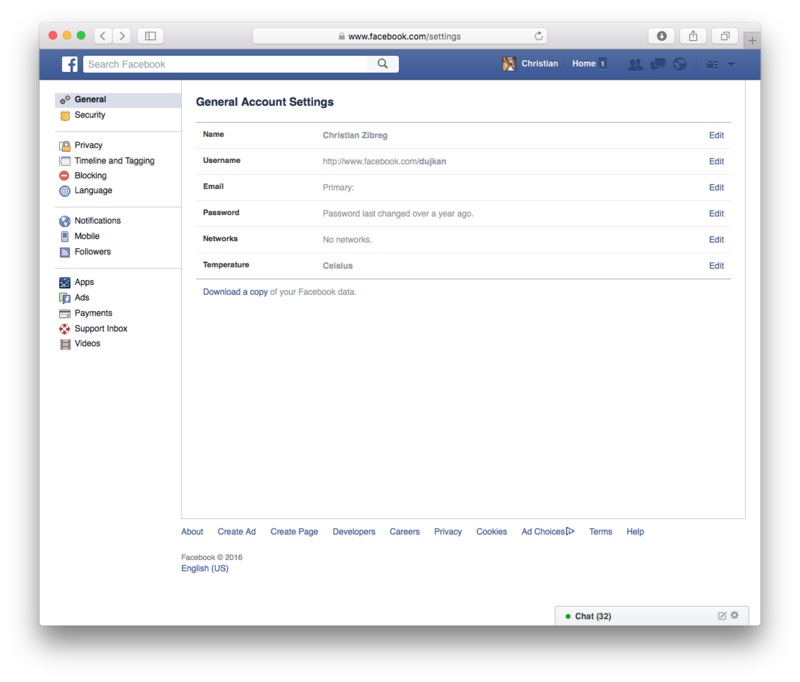 Step 1: Log in to Facebook on your computer and access Account Settings: click at the top right of any Facebook page and select Settings. Step 2: Click General in the lefthand column. Step 3: Click Download a copy of your Facebook data at the bottom of the General Account Settings page. 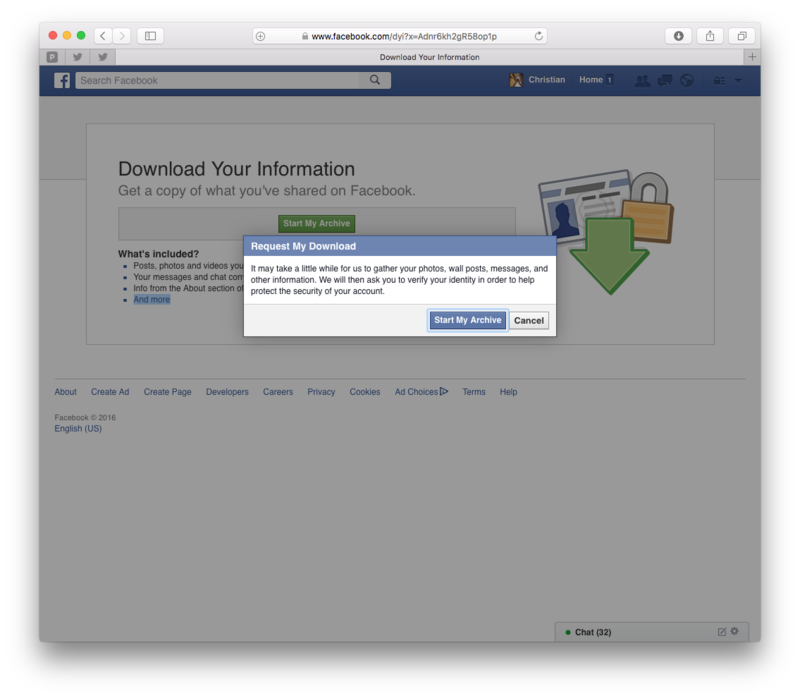 Step 4: You’ll be taken to a new webpage to confirm that you really wish to download your Facebook information. Click the green Start My Archive button to continue. Step 5: “It may take a little while for us to gather your photos, wall posts, messages and other information,” reads a prompt that appears. To continue, click the blue Start My Archive button. Step 6: You must now verify your identity by typing your Facebook password in order to help protect the security of your account. Step 7: A confirmation message pops up, saying the system is gathering your information and will send a message to the email address on file as soon as your archive is ready for download. Click Okay to dismiss the message. 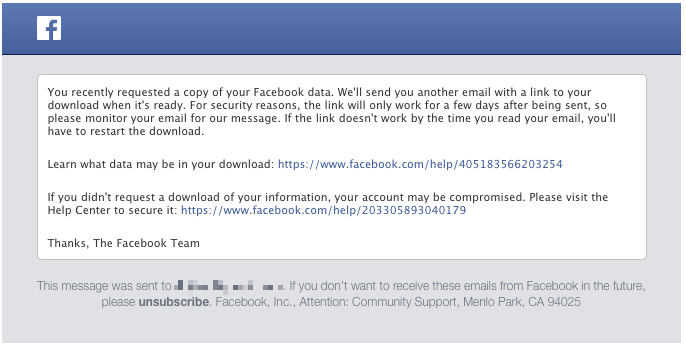 Step 8: Now check your inbox for a message from Facebook confirming that you requested a copy of your account data. You’ll receive another message containing a download link once it’s ready, which can take up to several hours. Tip: If you’re not receiving emails from Facebook, check your junk folder and ensure that Facebook’s emails are not classed as spam. 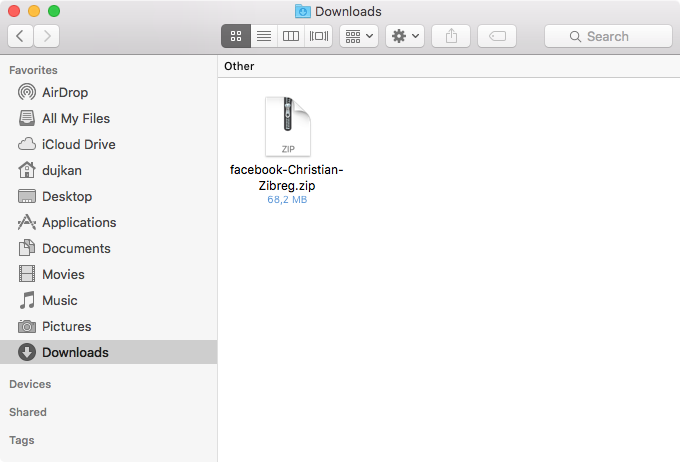 Step 9: When you receive another message containing a download link, click it to retrieve an archive of your Facebook data. Tip: Should the link redirect to Facebook’s Account Settings page, click Download a copy of your Facebook data again to go directly to the file. Click the green Download Archive button to continue. You might need to enter your Facebook password to start the download. Step 10: Go to the Downloads folder on your computer (it’s located inside your account’s home folder) and open the ZIP archive you downloaded to unarchive it. Because the archive contains private information, you should keep it secure and take precautions when storing or sending it, or uploading it to another service. For security reasons, this link will only work for a few days after being sent. 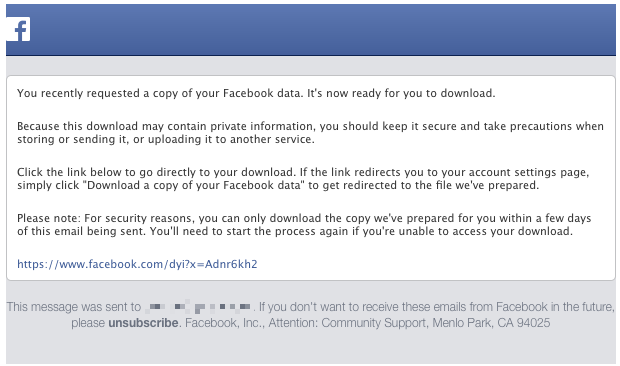 If it stops working, just create another request to download your Facebook archive. Detailed information about Facebook archives can be found further below. Facebook notes that some information may be unavailable. “We store different categories of data for different time periods, so you may not find all of your data since you joined our service,” writes Facebook. To learn more about data categories available to you after downloading a Facebook archive, check out this support document. If you’d like to request detailed information pertaining to personal data that Facebook stores on its servers, fill out this form. Upon downloading and unarchiving the archive, data from your Facebook profile is available within specific folders for pictures you have shared on service, videos you uploaded to Facebook and more. Upon opening “index.htm” in Safari, you’ll see a webpage with a crude representation of your profile along with the most important information from your About section and handy links in the lefthand column for quickly accessing specific data such as your friends list, messages, photos, videos, pokes and more. For instance, if you want to retrieve a specific picture or video you posted to Facebook, click Photos or Videos in the lefthand column and then click the media thumbnail. The photo or video will open it in its original resolution, and you can right-click to make a copy of the media file in another folder on your computer. You can also browse these folders directly on your computer. 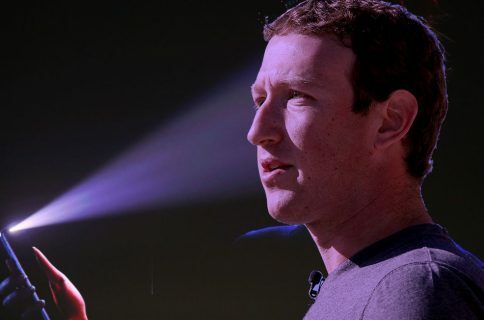 Data included as part of your Facebook archive may change over time as the company introduces or kills features so best thing you double-check their support document prior to downloading your archive. Let us know what you think about this how-to in the comments below and keep those tutorial suggestions coming via tips@iDownloadBlog.com.